Crusader Stacy and I knew there was something we needed to take care of soon after arriving at our Florida vacation destination. I know you are thinking, “Get cupcakes!” and you aren’t entirely wrong…However the first thing on our agenda for the week was a girls’ afternoon to get manicures and pedicures. After all, a vacation is about being pampered and our toes deserved some attention for all the time they’d be spending out in the Florida sun, right? I’d be lying if I said we hadn’t thought of getting cupcakes on the way to our appointment, so that we could sit back in the massage chairs savoring a sweet treat. But, we mustered up our patience and enjoyed our sister-time sans cupcakes. After our nails were beautified we decided it was time to show them off with a walk through Bell Tower Shops in Fort Myers, Fl. 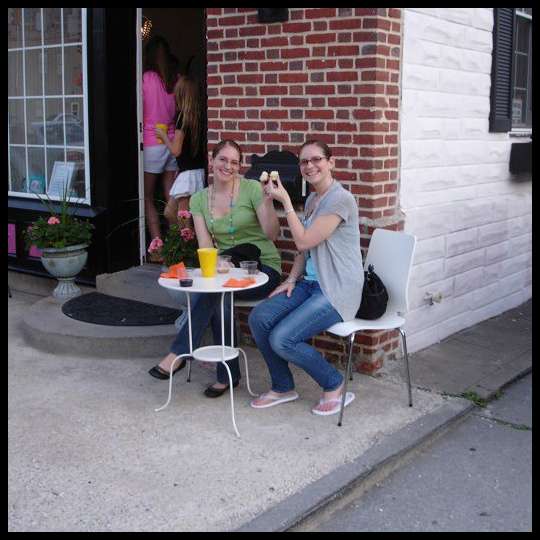 The location of Grace & Shelly’s Cupcakes couldn’t have been more perfect for us. 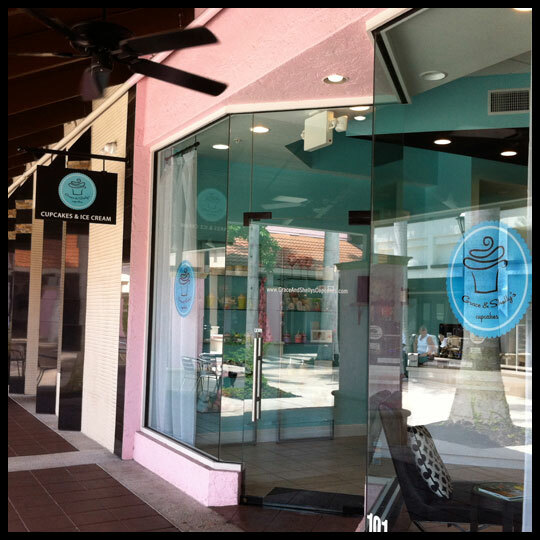 Only a few miles away from our nail place, and situated in a center of high-end retailers and boutiques, we could enjoy the warm weather and shop a little. We found Grace & Shelly’s easily and admired their cute store. They have some small tables, cupcake merchandise, and something extra…ice cream! This is becoming more common to see in our Baltimore-DC metro area, however in Florida I imagine it’s great for business, with having “ice-cream-weather” year-round. It wasn’t easy to pick out flavors because they all looked so good! 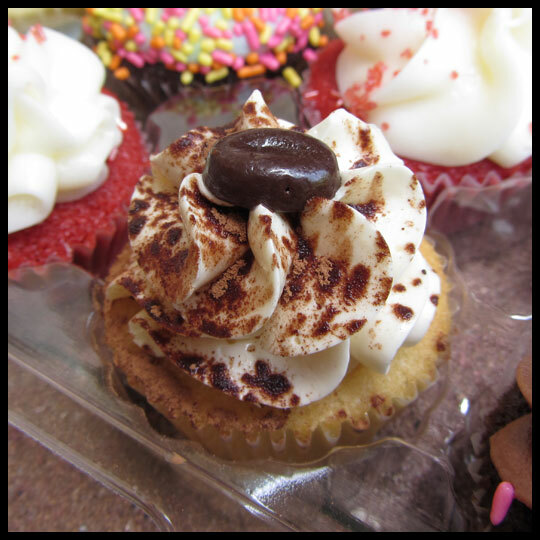 Their cupcakes are gourmet size, so a little larger than your average cupcake, and adorned with toppings. Lucky for us, they also sell pre-assembled containers of mini cupcakes by the dozen. We picked one out and then made our selection of larger cupcakes based on what was left to try. In the end, we were able to sample 13 flavors! The standouts for us were the Chocolate Raspberry, Caramel Brown Sugar, and Tiramisu. 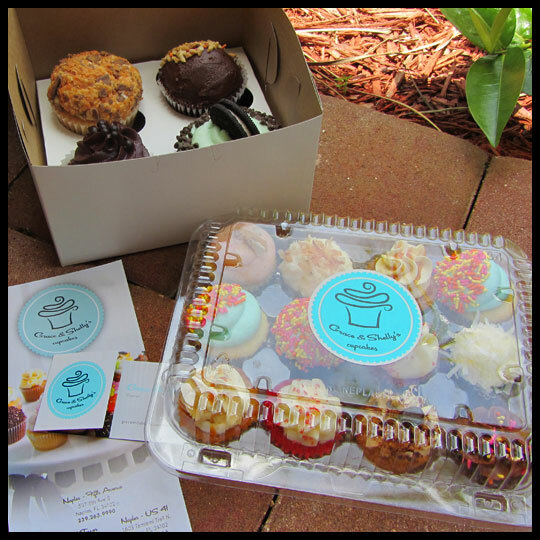 Some of the cupcakes were on the sweet side, even for us, but what you can expect from all Grace & Shelly’s Cupcakes is moist cake and creative and flavorful combinations. Chocolate Raspberry has become my go-to for a decadent chocolate treat. Typically paired with a dark chocolate ganache and raspberry filling, it’s rich and makes me believe that nothing could ever be a more perfect combination. Grace & Shelly’s version of this treat is no different. The raspberry to chocolate ratio was perfectly balanced and Stacy and I weren’t willing to share with anyone else! 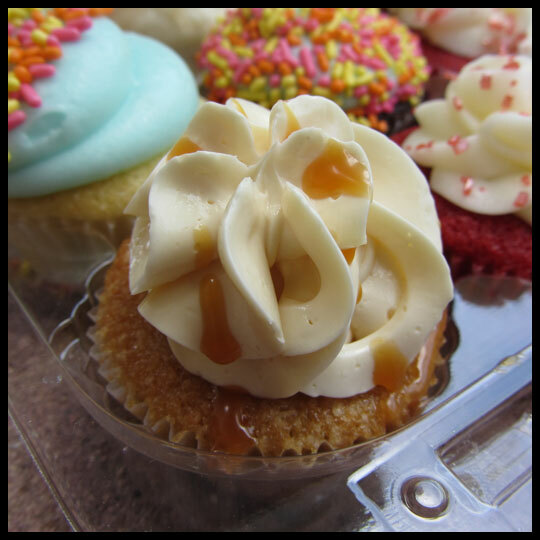 We contemplated getting the Caramel Brown Sugar cupcake in a full-size, but opted not to, since our sample pack included two. After trying our small bite, we wish we had a larger one! The cake was so good and the frosting was buttery, a prefect complement to the caramel drizzle. Crusader Elisa would have loved it! Crusader Stacy called dibs on this mini and, like the Caramel Brown Sugar, was wishing she had more. So was I, since I didn’t get to try it! But, as Stacy described it, it was, “Delicious. The espresso liquor made the cake a little squishy, but it didn’t matter because it was so good. 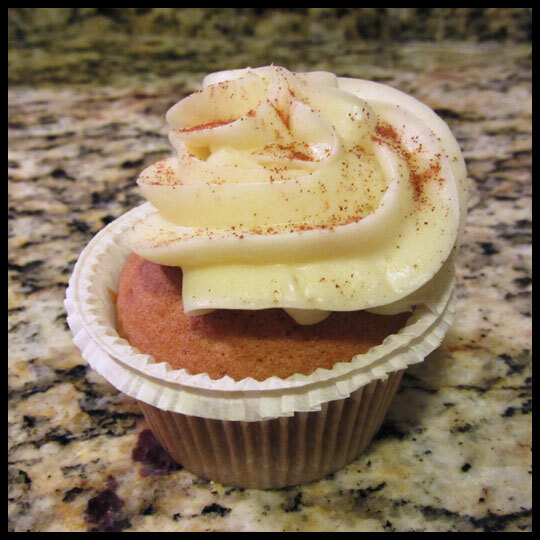 And sometimes that can happen with tiramisu.” We both believe that the full-size cupcake would have stood up better to the espresso liquor drizzled on the cake and are waiting for when we have the opportunity to try it again! 1) Chocolate Peanut Butter: Chocolate cake with a peanut butter filling and chocolate ganache frosting. 2) Grasshopper: Chocolate Oreo cake with mint frosting and chocolate chips. 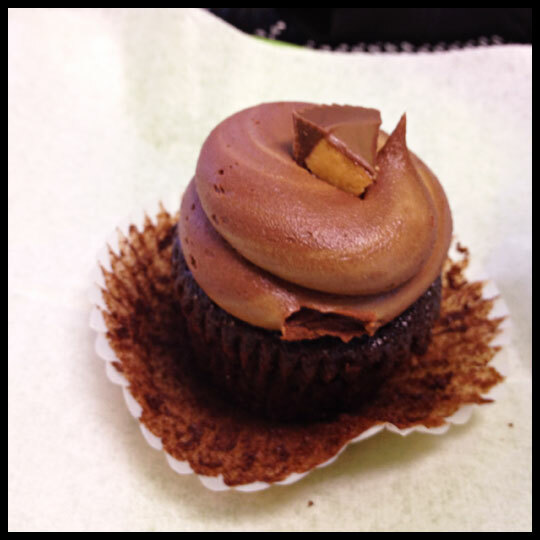 This cupcake was a contender for our top three! 3) Butterfinger: Vanilla cake with a peanut butter filling, cream cheese frosting, and topped with crushed butterfinger bars. 4) Vanilla-Vanilla: Vanilla cake with vanilla buttercream, topped with colorful sprinkles. We loved the decoration on this mini, and the full-size looked the same! 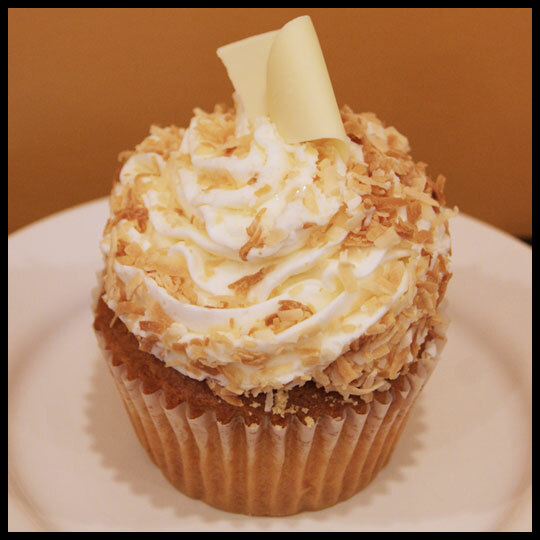 5) Orange Coconut: Orange cake with a cream cheese frosting, topped with toasted coconut. 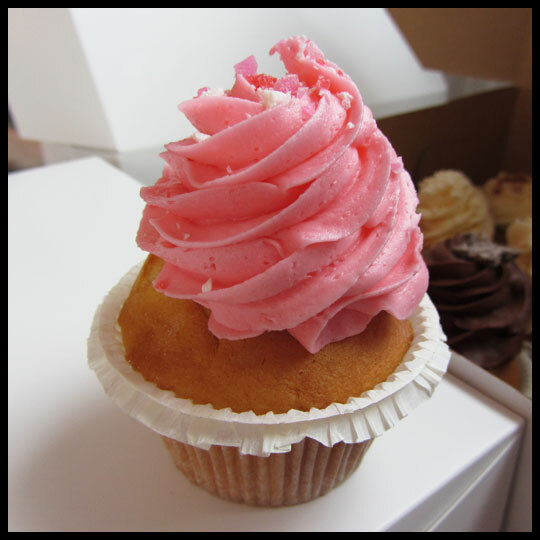 6) Vanilla Strawberry: Vanilla cake with strawberry buttercream frosting, topped with a vanilla cookie. My husband really liked this cupcake and said it was as good as his favorite Maryland bakery. 7) Chocolate-Chocolate: Chocolate cake with a chocolate buttercream frosting, topped with sprinkles. 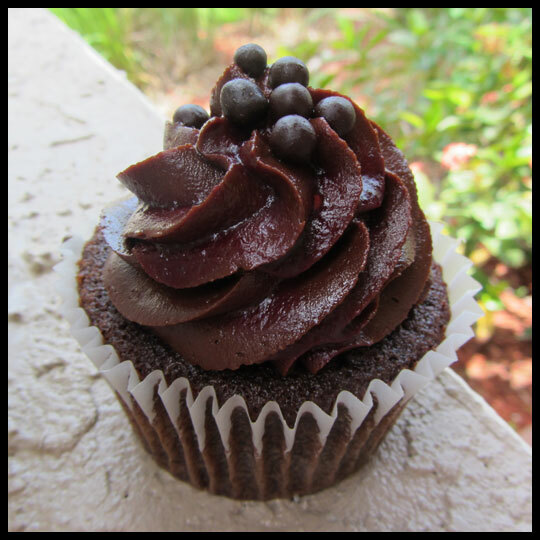 Crusader Stacy’s husband would have liked this cupcake better if it had a chocolate ganache frosting instead of a chocolate buttercream, but for the chocolate lovers out there, Grace & Shelly’s does offer a triple chocolate cupcake with that combination and a chocolate filling! 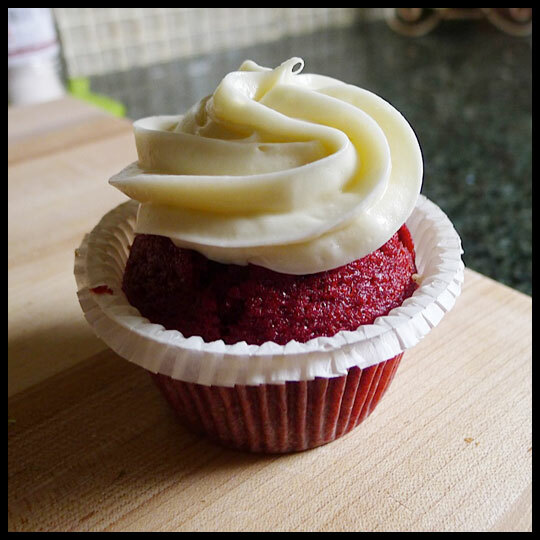 8) Red Velvet: Red velvet cake with a cream cheese frosting. Littlest Crusader Leah (aka: my daughter) really enjoyed this cupcake, including the sweet cream cheese frosting, although we believe it may have been too sweet for Crusader Elisa, our red velvet connoisseur. 9) Black and White: Chocolate cake with vanilla buttercream and topped generously with sprinkles. Although not really black and white due to the vibrant frosting and sprinkles, it was fun! 10) Chocolate Coconut: Chocolate cake with vanilla buttercream and topped with shaved coconut. Not only are the cupcakes from Grace & Shelly’s memorable, so was the service. A nice man explained all the flavors to us, offered suggestions, spoke about the other locations when he found out we were vacationers, and once we completed our purchase, he walked our bag around the counter to hand it to us (a lost art in fine customer service). His enthusiasm about the product was obvious and contagious. I wouldn’t hesitate to recommend Grace & Shelly’s to my Florida family, or anyone else vacationing in the Fort Myers area! We are excited to have a new Guest Crusader, Erin! She is a friend of the Crusaders who LOVES cupcakes. 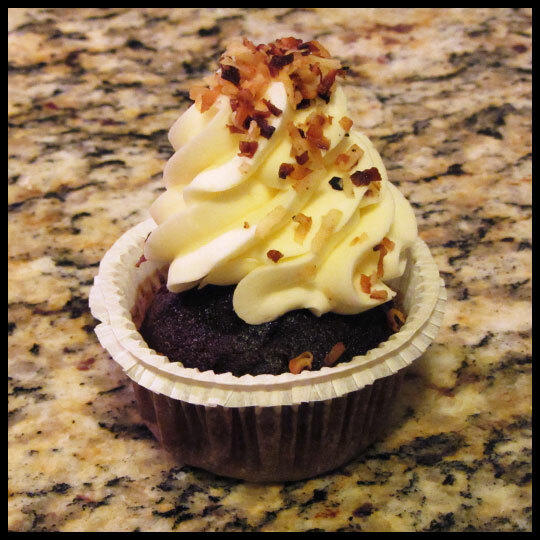 She is sharing a review with us today on Sweet Carolina Cupcakes, a cupcakery she stumbled across on a recent trip to South Carolina. Thanks for sharing this with us Erin! Recently I drove to South Carolina to visit my friend who lives on Hilton Head Island. Now if you’ve ever been to Hilton Head, you know there’s not much to do on the island except go to the beach and other ocean related activities (such as surfing). As my luck had it, it rained for the majority of my visit, so for lack of something better to do, my friend suggested that we walk around the Coligny Plaza Shopping Center. 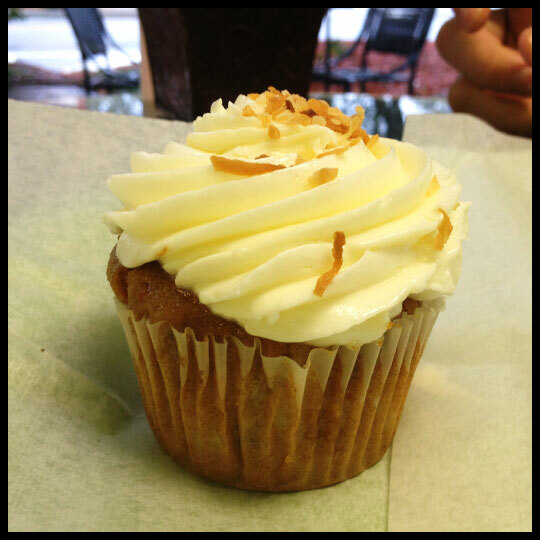 Sweet Carolina Cupcakes is located in the middle of the maze of shop that is Coligny Plaza, but if you do make the effort to find it, you’ll find it’s well worth the hunt. On their website, they claim to be “The Lowcountry’s Premiere Cupcakery” and they apparently offer different flavors on different days of the week. The shop itself has a blindingly bright lime green and hot pink color scheme and is pretty small. The common area only had two 2-person tables and a back wall bar to sit at. The day we were there, they had ten flavors to choose from (pictured below). They also had a small selection of muffins and whoopee pies for non-cupcake people. The cupcakes themselves are larger than what I would consider an average-sized cupcake. They were closer to the size of a large muffin, but were priced averagely at 3.50 each. While I was trying to choose my flavor, I asked what the Sweet Carolina (a bright pink cupcake with vanilla icing and pink sprinkles) was and was told that is was Sweet Carolina Cupcakes’ take on a “pink red-velvet” cupcake. I didn’t end up buying this one because I am not a huge fan of red velvet, but I wondered what Red Velvet Cupcake Crusader Elisa would think of a pink-velvet cupcake. After quite a long deliberation I settled on the following cupcakes. My boyfriend actually chose peanut better cup because he doesn’t really like desserts or sweets EXCEPT for anything that is peanut butter flavored (I know, I think he’s crazy for not liking sweets). He did let me have a bite though. The chocolate cake was moist and full of dark chocolaty goodness. The cake was also very light and fluffy. The icing was smooth and VERY peanut buttery. My boyfriend who loves peanut butter thought the icing was great. I thought that the dark chocolate was a little overpowered by the peanut butter flavor, but I am also not a huge peanut butter fan, so I probably would never order this flavor for myself. I ended up choosing a Carrot Cake cupcake for myself and was not disappointed by my choice. The cake, again, was light and fluffy, especially for carrot cake. I think the lightness of the cake was a great feature since the cupcakes were larger than average. If the cake had been too dense and “meaty,” I don’t think I would have wanted/been able to eat a whole cupcake (which I did easily). The flavor of the cake was not very spiced, but it did have a great texture of nuts, carrots and coconut. The icing tasted like a combination of buttercream and cream cheese and was pretty smooth and thick. Overall, I enjoyed this cupcake, although I did end up left with a mound of icing on my plate that I didn’t eat (I like my cupcake to icing ration about 2-1 cupcake to icing). The friends I was with also got Red Velvet, Chocoholic and Classic Chocolate with Vanilla Icing cupcakes. (Sadly I didn’t manage to get photos of them before they were devoured.) My friend who bought the Red Velvet said it was better than the Peanut Butter Cup (which she also tried) and my friend who bought the Chocoholic cupcake couldn’t stop talking about how good it was and asking when he could go back and get another. 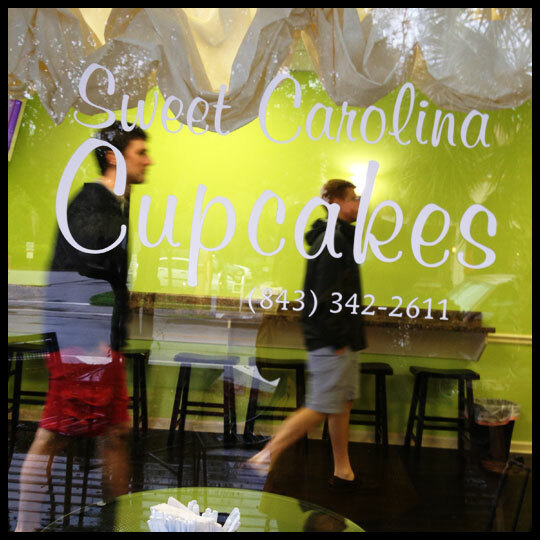 Overall, Sweet Carolina Cupcakes gets a big stamp of approval. 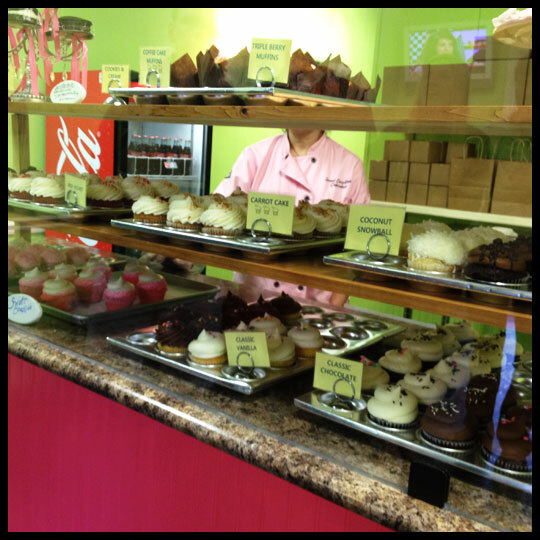 Their cupcakes are larger than average, reasonably priced and full of flavor. If you’re ever on Hilton Head Island, make sure you stop by and try one! 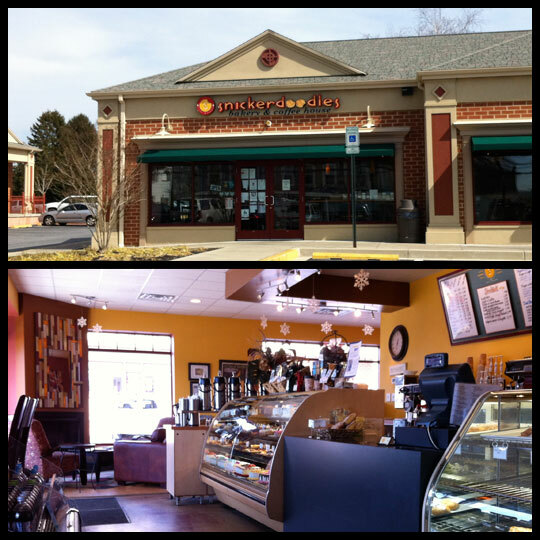 Named after the common cookie, I wasn’t sure what to expect from Snickerdoodles Bakery and Coffeehouse (Hampstead, MD). Would it just be a take-out bakery that you stop in on your way to work for a quick cup of coffee and a muffin? When I finally went to their shop, I was surprised and pleased to find a sophisticated bakery and high-end coffeehouse, with plenty of room to bring friends and gather around one of their many tables, or just to come yourself and relax in their cozy surroundings. The mom in me loved seeing that they even have a miniature table with chairs, inviting guests to bring their kids with them. After taking in the great atmosphere, I began investigating the goodies. My first thought? “WOW! Those cupcakes are HUGE!” My second thought? “How much are they?” With their size and the decoration and toppings on most of the cupcakes, I thought they would be pricey. However, they aren’t! At $3.00-4.00 for the large cupcakes, they are very reasonably priced. And the best part is that they are large enough to share (or to have more than one helping for yourself)! 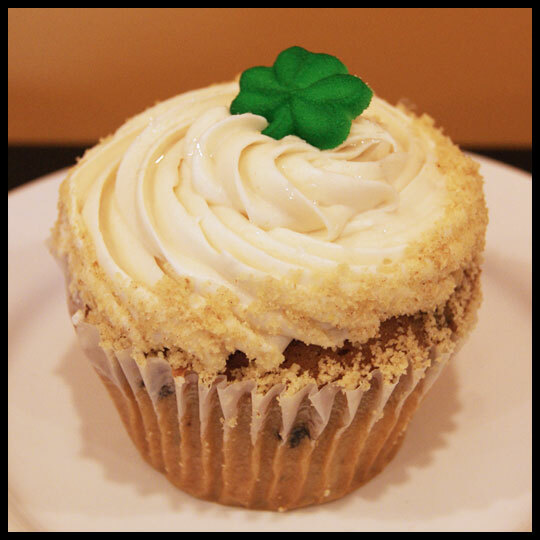 During the St. Patrick’s Day season, we see a lot of these cupcakes based on the popular drink (Guinness and Bailey’s Irish Cream) pop up. I’ve had a few takes on the idea, and this one is a clear stand out for me! I usually see these cupcakes done with a chocolate cake, however Snickerdoodles has choosen to make this a true Guinness stout cake. None of the smooth Guinness flavor is lost and, just like an Irish Car Bomb, the Bailey’s Irish Cream filling and frosting complement the cake perfectly. It is so moist and flavorful! 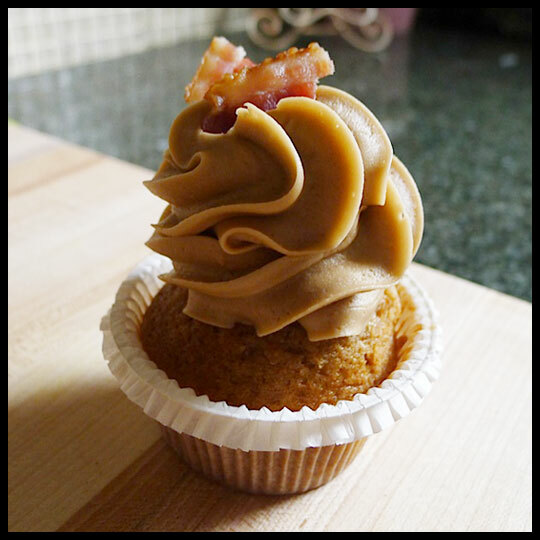 I think the best way to describe this next cupcake is with a photo. Yes, ladies and gentlemen, that IS a whole (mini) cannoli on top! 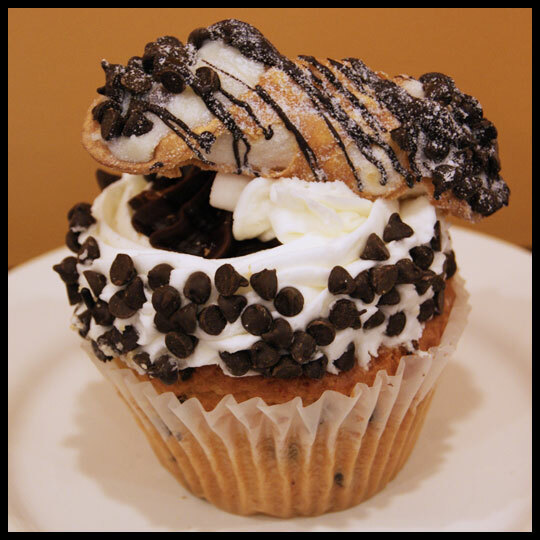 This cupcake has a chocolate chip cake that is moist and delicious, with a cannoli filling that I think even the toughest critic would appreciate, and is topped with a chocolate ganache frosting, American buttercream, and more chocolate chips. For the Crusaders, this has become a classic combination. We love the pairing of almond and raspberry. 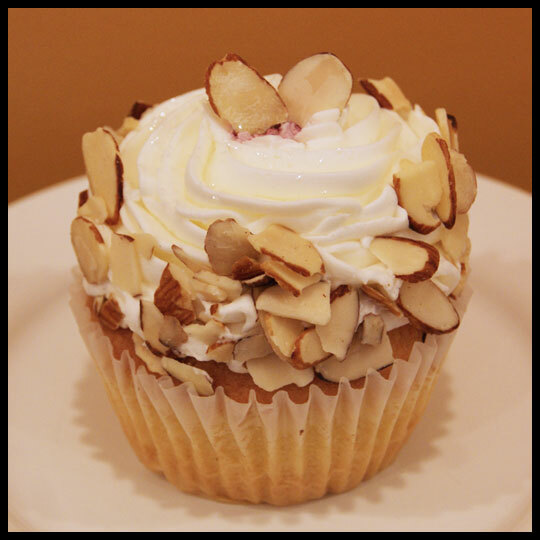 This cupcake has an almond cake, whipped raspberry filling and American buttercream frosting. I think the whipped raspberry filling is a nice change from the usual jam filling and also helps keep the cupcake light. This Red Velvet cupcake has been taken to the next level. I was really happy with the moistness of the cake! I’m always disappointed with red velvet cake, however this one is not only moist, but also has a great flavor. 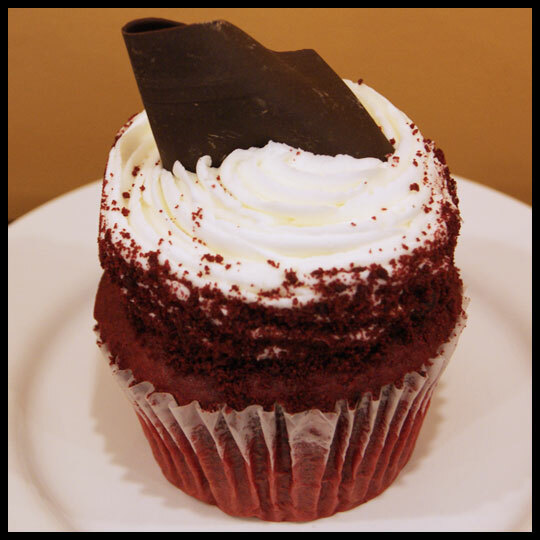 It’s paired with a cream cheese filling, American buttercream frosting, and topped with a chocolate shaving and toasted red velvet cake crumbs. The frosting makes this cupcake really sweet, but I enjoyed every bite! This is another classic flavor. With the decoration, this cupcake needs no label. All together the cupcake works, however it isn’t as “coconut-y” as I prefer. That being said, the moist poundcake-like cake, whipped filling, buttercream frosting, and generous toasted coconut shavings on top are still really tasty! 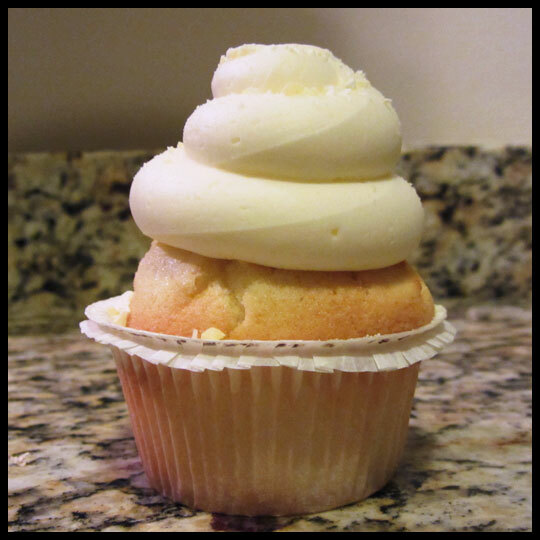 This cupcake is a new one Snickerdoodles is working on and there’s only one way to describe it: Fun! Based on their “famous” Rainbow Cake, the Rainbow Cupcake is a miniature version. 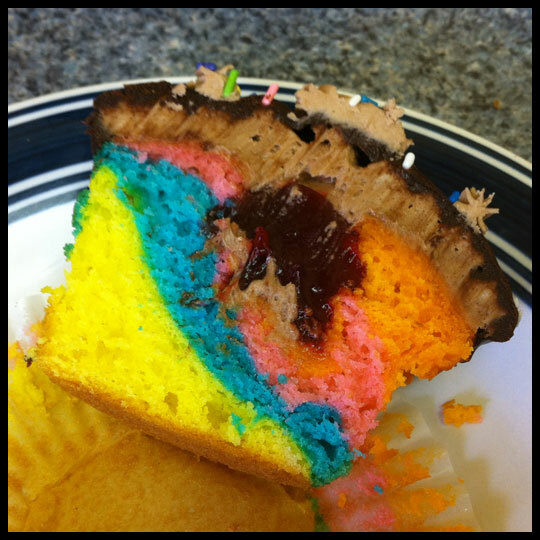 I think it’s necessary to also show a photo of the inside of this cupcake, to really get a good idea. 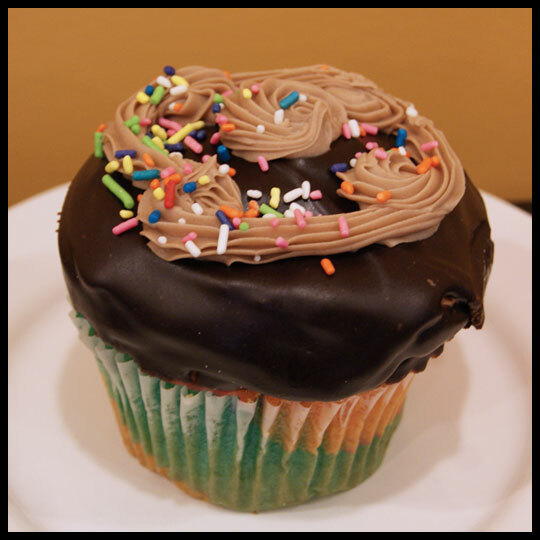 As you can see, this cupcake has a rainbow cake, raspberry puree filling, chocolate buttercream frosting, dipped in chocolate, then piped with more chocolate buttercream, and topped with sprinkles. The cake is moist and the jam and chocolate combination is delicious! If you have a chance to visit Snickerdoodles, please do! Whether you are looking for a special treat, a great beverage, or a place to just hang out, Snickerdoodles has it all! They also have beautiful full-size cakes, pastries, and cookies. I can’t wait to return! And, keep a look-out for Part 2 where we’ll be reviewing Strawberry White Chocolate, Carrot Cake, Boston Cream, Black Bottom, a fun, fancy, party cupcake and Death by Chocolate! 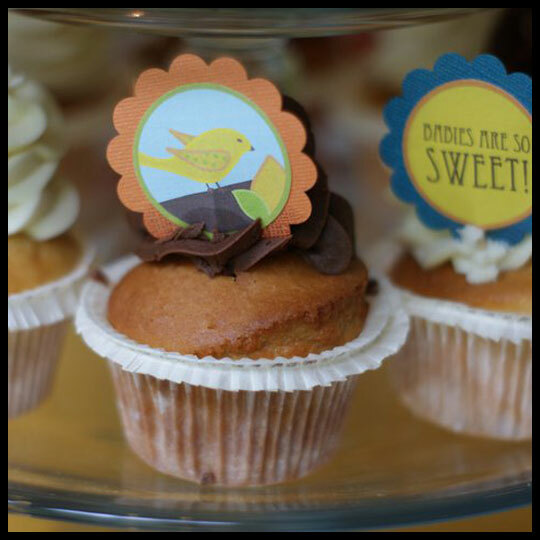 Last week we heard that Caroline’s Cupcakery, located off Fort Avenue in Locust Point, was closing. Hearing this sad news, Crusader Elisa and I planned our final visit for their last day, which was this past Saturday. Caroline’s has always been one of our favorite places to get cupcakes. 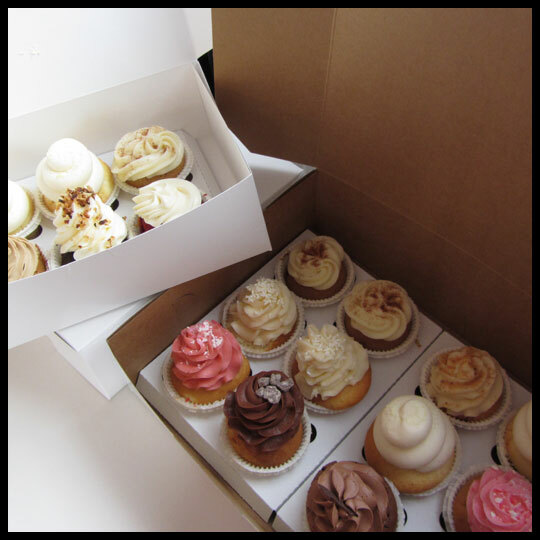 We even listed it as a Top 5 pick for cupcakes inside Baltimore City on KimberlyLoc.com. Since this may have been the last time we were able to indulge in their signature “mile-high” frosting and fluffy moist cake, we decided to focus on getting our favorite flavors. We were also able to try a new cupcake. 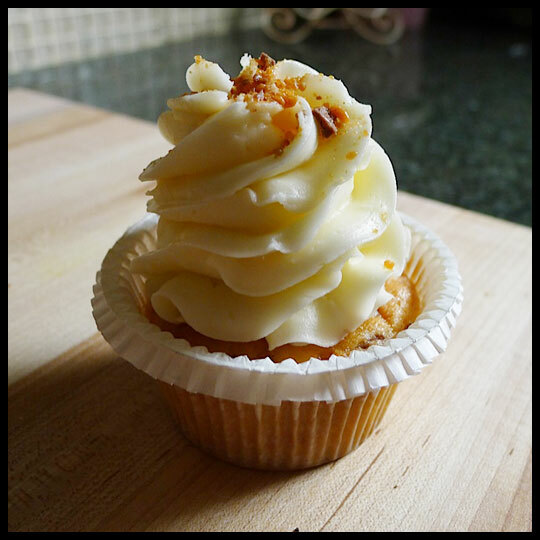 It was called the Butterfinger Candy Bar Cupcake. This cupcake was buttery and sweet, just like a Butterfinger should be. The only thing that could have made it better would be the addition of more chocolate. (You can never have too much chocolate). Every bite of these cupcakes brought back some great memories. The Pink Wonder with Strawberry Drizzle took me back to my first experience with Caroline’s when Jenn and I attended a wine and cupcake night and were able to sample tons of mini cupcakes paired uniquely with specific wines. Then, the Citrus Wonder with Lemon Drizzle reminded me of Jenn’s baby shower. We got a variety of cupcakes from Caroline’s, but this was a clear favorite of the day and was perfect with the hot summer weather. 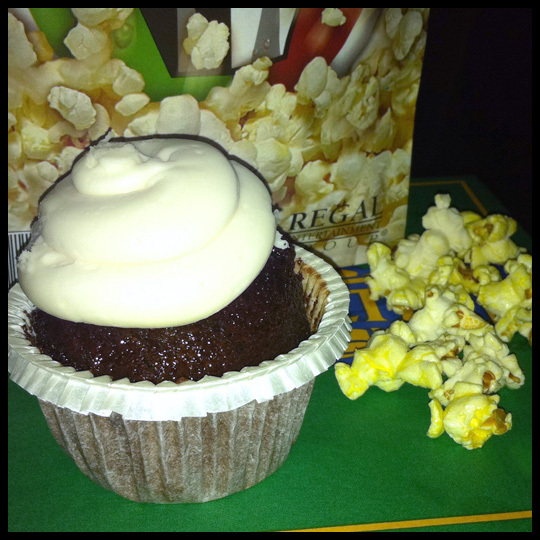 I also thought back to a more recent Caroline’s cupcake adventure where Elisa brought us Hot Chocolate cupcakes to enjoy while watching the most recent Twilight movie at the theater. 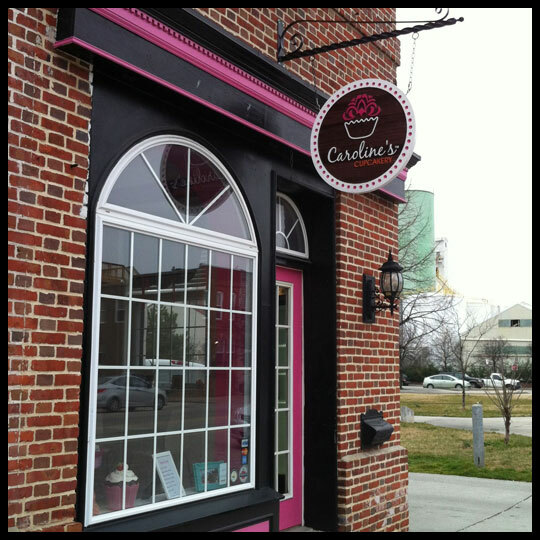 Caroline’s will not only be missed for their amazing cupcakes, but for all the many wonderful memories we’ve had that have included their cupcakes. We love you Caroline’s Cupcakery!